Our fox cubs are growing very fast! 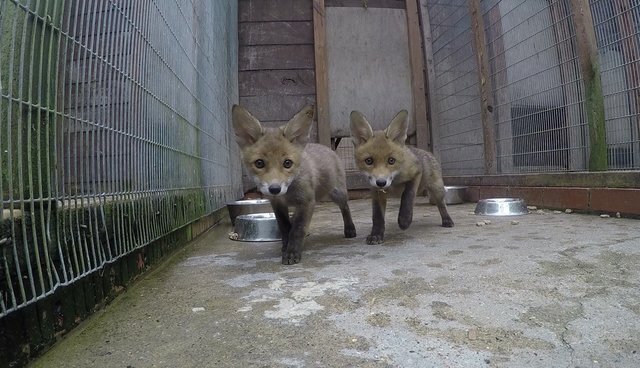 Lonely Boy, Feisty Girl and the two cubs rescued from the storm drain are amongst our 14 young foxes currently being cared for at the center. They are now in a larger pen with outdoor access to help them get used to the weather. They have minimal contact with our volunteers and are enjoying time on their own. They will be soft-released in July, in a lovely area. A soft-release is a gradual release; the animals are put in an enclosure where they can see their surroundings and get used to the smells and the sounds of the woods. After a week or two, the fences of the enclosure are taken down and off they go! You can have a look at what they are up to during the day!